25 IN THE BEGINNING WAS THE WORD. 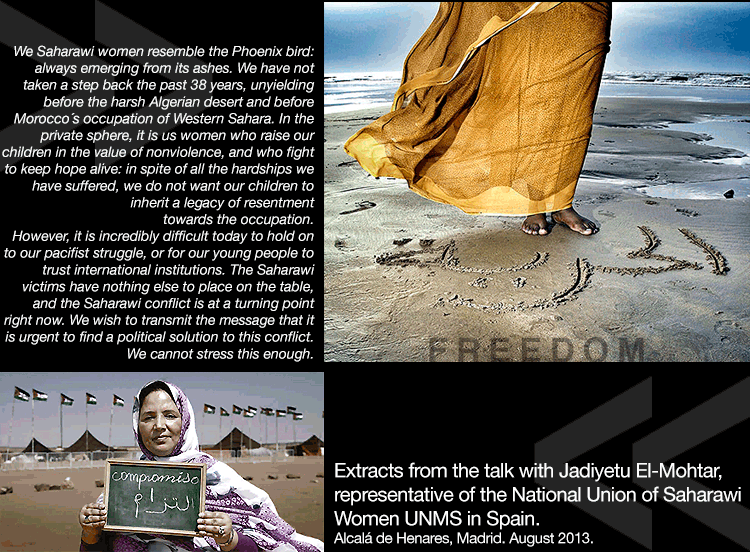 WOMEN OF THE SAHARAWI PEOPLE : look at the publication. Or follow this link to read the project in pdf format. If you want only to view the photo gallery, do it here. In contrast to the rest of Arab societies, Saharawi people display extraordinary levels of gender equality. 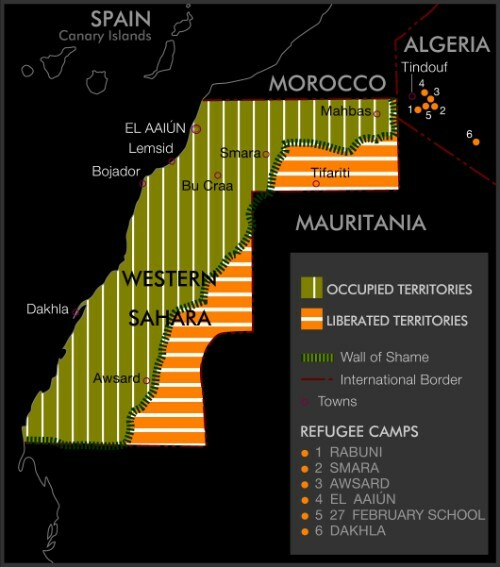 It is no coincidence that, after fighting side-by-side with men to attain sovereignty and get their land back after Spanish Colonization, and the invasions by Morocco and Mauritania, women were chosen to set up the refugee camps in Algeria. The Saharawi population had been forced into exile and the men had had to stay behind in the trenches they dug across the desert. Women carried their mission out in an exemplary manner, while feeding their children and withstanding many hardships. Today women are also at the forefront during the peaceful and massive demonstrations held in the Occupied Territories. Women from Saharawi have been tortured or imprisoned together with their male countrymen, for undertaking nonviolent resistance against Moroccan occupation. And it is the women who most insist that the Saharawi people have nothing against the Moroccan population and that their struggle is directed against the policies implemented by the King of Morocco and his government. Images of the exhibition in Santa Coloma de Gramenet (Catalonia). Presented by Weiga Beia Larosi, secretary of the League of the Sahrawi Youth and Students of Catalonia. Performance by the Teatre Social de Butxaca. 23rd May 2014. Click to visit the photo gallery of the exhibition. VIDEO OF THE OPENING OF THE EXHIBITION OF THE PROJECT IN THE STREET. Thirteen Saharawi women take the lead here, bearing witness to an injustice that has already lasted too long, and which continues to bypass the sovereignty of the Saharawi people. These thirteen women remind us that international legality supports their cause and the sovereignty of the Sahrawian State, warning the international community that if it does not pressure the Member States in the UN Security Council, blocking the Referendum so that they finally allow it – i.e. the United States and France – the Saharawi people may find it inevitable to take up arms again, though this is not an option they desire. Forty years is already too many years: even these women, who have withstood everything, begin to feel that they are exhausting their limits, and that they cannot endlessly continue to bear the effects of the hypocrisy and the humiliations that their people continue to confront. And this is certainly not hard to understand. Exhibition and publication project funded by the Coordinadora Catalana d'Ajuntaments Solidaris amb el Poble Sahrauí CCASPS supported by the Fons Català de Cooperació al Desenvolupament.